Joshua Kritzer, associate professor in the Department of Chemistry, prides himself on his laboratory’s interdisciplinary nature and focus on peptide biology to solve modern biomedical problems. “Traditionally, in drug discovery, the pharmaceutical industry has relied on small molecule drugs … but there is a limit to what we can affect with those drugs,” Kritzer said. Kritzer explained that despite being able to target some enzymes and receptors with small-molecule therapies, there are many more proteins within the body that cannot be inhibited by small molecules. This has led to a push in the pharmaceutical industry to use “non-traditional molecules,” including proteins, DNA and RNA. “These molecules present a great challenge to implementation, however, and there is a huge push to make them work better,” Kritzer said. The challenges with these non-traditional treatment options are the central focus of Kritzer’s lab. Kritzer’s journey to his current position at Tufts began as an undergraduate student at the Cooper Union for the Advancement of Science and Art in New York City. Kritzer received a doctorate in biophysical chemistry at Yale, after which he was a postdoctoral fellow at the Whitehead Institute for Biomedical Research at MIT. He attributes his current multidisciplinary research philosophy to this wide variety of academic experiences. Kritzer ultimately ended up at Tufts because he enjoyed the purely academic environment of a university during his time at the Whitehead Institute. “I missed all the students around, I missed all the mentoring. I didn’t want to be on an island that only did lab research, so I decided to apply as a faculty member to a university where I could run a chemistry lab at a place that still values teaching,” Kritzer said. 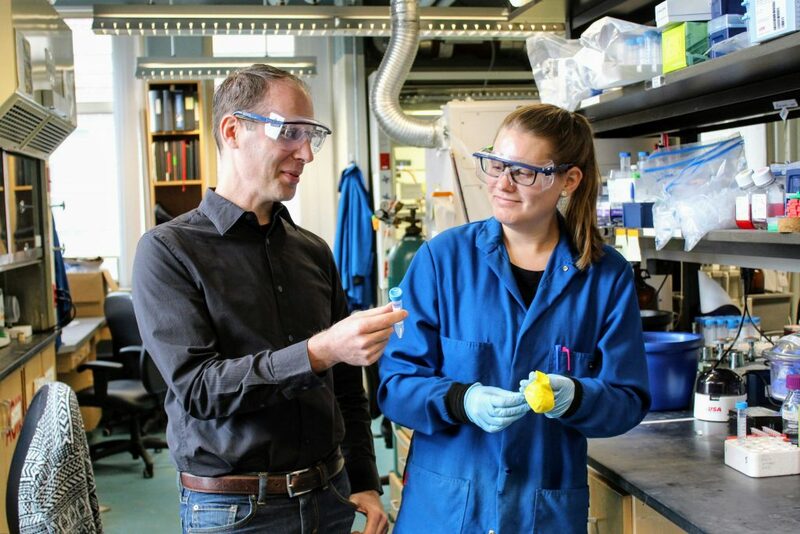 According to its website, the Kritzer Laboratory aims to incorporate ideas from systems biology, genetics, organic synthesis and analytical chemistry in order to create peptide-based molecules that target disease-associated proteins. Kritzer described one study done in his lab in which a Ph.D. student designed a molecule to better understand autophagy, a cellular recycling process. After identifying the molecule in a test tube and testing it on mammalian cells, the student determined that the molecule caused autophagy in the cell. Third-year Ph.D. candidate Kirsten Deprey is currently researching cell-penetration peptides that she developed with the help of a previous graduate student. “There was, and still kind of is, a lack [of research] that can tell whether a drug can actually get into the cell or not,” Deprey said. Deprey is now using RNA therapeutics — the process of incorporating RNA-based drugs into the cell — in her research, further underscoring the Kritzer Lab’s interdisciplinary scope. According to Deprey, testing RNA therapeutics involves measuring changes in tumor size and tracking fluorescence-tagged therapeutics using microscopy. The process poses unique challenges, especially because high amounts of RNA can be toxic for cells. “You can’t really tell, quantitatively, how much of the drug gets inside the cell,” Deprey said. She explained that to solve this problem, she is making chemical modifications to the RNA molecules’ structure in order to give them better access inside the cell. Deprey noted that research surrounding cell penetration, including her own, has become the main focus in the lab and mentioned that in addition to her approach, a library of thousands of proteins has also been tested. “There are four main projects on the cell penetration [research] right now, so I think that this is the main focus,” she said. Deprey highlighted the techniques that she has learned, as well as the general method of procedural reasoning, as the takeaways from her work at the Kritzer Laboratory. “I certainly think that that skill set — both the soft skills and the technical skills — will be useful whereever I go in the science realm,” she said. Eriko Koide, a senior majoring in biochemistry, has spent three years working in the Kritzer Lab. She developed an interest in chemistry after taking introductory classes in the department and began conducting research as a sophomore. “I decided that I wanted to try research because I decided that I didn’t really have any interest in medical school, so I thought that research would be a good opportunity to see what’s out there,” Koide said. Koide was particularly interested in the Kritzer Lab because she heard from another student that Kritzer is an engaging mentor. Koide is currently working on two projects at the laboratory. The first involves testing antibiotics against a bacterial protein found in various pathogens, which cleaves an important antibody in human cells and attacks the immune system. Koide’s second project concerns the SHIP-2 protein, which is important in signaling cell growth and communication. Code hopes to parlay her experience in the Kritzer Laboratory into a position as a lab technician in order to broaden her experience before applying to graduate school. “Beyond that, what happens will be based on my experience in graduate school [regarding] whether I want to become a professor or work as a researcher or even go into patent law,” she said. In terms of her experience with Kritzer, Koide recommends that undergraduate students who do not know what research they want to conduct try to find a good lab environment. “The best way to do that is to talk to [juniors and seniors], asking which professors are hands-on and in which lab you can become an independent researcher,” she said. Koide said that working at the Kritzer Lab has allowed her to receive personal attention that has benefitted both her personal and academic development. “Both the graduate students who trained me and [Dr.] Kritzer have really put an emphasis on helping me grow from my mistakes and how to design my own path in research,” Koide said. Kritzer explained that for research like that of Deprey and Koide, he does not see the lab’s multidisciplinary focus as a goal itself. Instead, in using fields like organic chemistry, cell biology and physical chemistry, he hopes to address issues in the most effective and efficient way possible.